Materials scientists figure out ways to make things stronger, cheaper, or better. A favorite technique is nano-self-assembly. Just mix together the right ingredients and "presto", you get a wonder material. Another great development would be for the material to be self-repairing. MIT scientist, Michael Strano, and his team have created a material made up of seven different compounds including carbon nanotubes, phospholipids, and proteins. Under the right conditions they spontaneously assemble themselves into a light-harvesting structure that produces an electric current. The assembly breaks apart when a surfactant (think soapy solution) is added but reassemble when it is removed. These new self-healing solar cells are already about double the efficiency of today’s best solar cells but could potentially be many times more efficient. 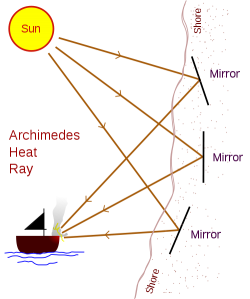 Did Archimedes use a heat ray to set enemy ships on fire over 2000 years ago? A text written about the Siege of Syracuse (212BC) some 400 years later merely said he lit the ships on fire. He could have used flaming arrows or perhaps hurled larger balls of flame via catapult. Anthemius of Tralles mentions burning-glasses as Archimedes' weapon. In 1973, an experiment using 70 mirrors, each with a copper coating and a size of around five by three feet, caused a mock-up ship 160 feet away to burst into flames within seconds. A group of MIT students used a parabolic array of 127 "polished metal mirrors" 1 sq ft in size for a 2005 MythBusters episode and were barely able to set part of the "ship" aflame. I recently came across this video of a recreation of the Archimedes heat ray experiment. 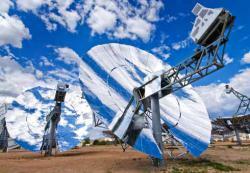 The technology could improve solar energy efficiency from 30 to 66 percent! That's incredible. Furthermore, the improvements may also cut manufacturing costs (and carbon footprints) by removing the need for high temperature processing. The ramifications for nanotechnology and clean energy abound. 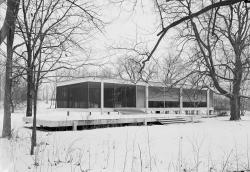 Farnsworth House: Built in 1951 near Chicago by Ludwig Mies van der Rohe as a one room retreat for Dr. Edith Farnsworth. Purchased in 2003 for a reported $7.5 million, it is now operated as a house museum. The house is listed in the National Register and is designated a National Historic Landmark by the United States Department of the Interior.Courtesy Jack E Boucher LUMEN means “the power of light". HAUS is a reference to the Bauhaus movement and architect Mies Van Der Rohe's Farnsworth House. Like the Farnsworth House, Lumenhaus can open up to maximize its occupants’ exposure to natural daylight. Lumenhaus, designed by Virginia Tech, has a good chance of winning the Solar Decathlon Europe 2010 competition which ends today. Lumenhaus is a zero-energy home that is completely powered by the sun. Using technology, Lumenhaus' automated systems make the owner’s life simpler, more energy efficient and less expensive. An iPhone app allows its users to monitor everything real time and to even override controls. I would really like to live in a house like this. Another Solar Decathlon competition is happening, this time in Europe. The Solar Decathlon Europe 2010 is a competition between 20 college and university student teams to design and build the best solar home. The houses must use readily available products and be easy to transport and assemble. I would really enjoy designing and living in such a house of my own. Watching teams of experts compete to design innovative, efficient, and sustainable housing is a great place to get ideas. SDEurope.org has a 17 page PDF download which explains how a maximum 1000 points can be earned in the 10 categories. On the one hand, the competition will include objective methods for scoring, which will include measurable parameters such as the actual energy consumption of the houses, the capacity for solar energy capture, etc., as well as tasks performed by decathletes which reproduce domestic activities. In addition, a number of evaluations will be made by a panel of jurors with proven experience who will judge qualities such as: architecture, innovation, sustainability, solar systems, communication and industrialization level. The final score given to each team will be made up of a balanced combination of both objective and subjective assessments. 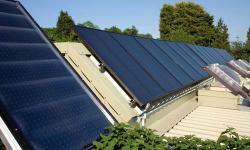 Solar cells produce less than 1/1000 of the Earth's electricity. 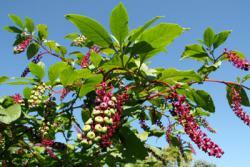 This is mainly because they are expensive and are made from rare, hard to obtain materials. An IBM research team, managed by David Mitzi, is working on photovoltaic cells that are made from common materials. This new material, called kesterite, was 6.8% efficient in 2009. IBM increased the efficiency to 9.8% and is planning to increase the efficiency above 11 per cent, which is equal to or better than the traditional solar cells. I hope to one day live in a house that produces more energy than it uses. A competition between 20 such houses is going on right now on the Mall in Washington DC. The Solar Decathlon joins 20 college and university teams in a competition to design, build, and operate the most attractive and energy-efficient solar-powered house. Points awarded in ten categories determine the overall winner. As of today (Mon) we have climbed up to 7th place(click for most recent rankings). I have been excitedly working my way through information as it comes in. You can follow a umn_solar_house Twitter feed and there is an ICON Facebook fan page. The Solar Decathalon landing page allows you to jump to photos, videos, and team websites(not working? Try the site map). The University of Minnesota's ICON landing page branches off into a blog, a virtual tour, and lots of educational pages about design. The media (WCCO News and Washington Post) and bloggers (myself included) will be all over this. I recommend GetEnergySmartNow.com's cheat sheet and their overview of the UMN ICON house. You can also download a 966KB PDF media kit about the Solar Decathlon.